The Chinese yuan is struggling to find direction against its American counterpart on Tuesday as the market weighs several stories impacting the national economy. From President Donald Trump’s latest swipe on Beijing to the rising tide of corporate defaults, China is bracing for a lot of pressure heading into next year. A new report finds that a growing number of Chinese businesses could default on their debts if they are issued In US dollars. Because of rising borrowing costs and a declining yuan, a lot of companies could potentially fail to meet payments, especially since more bonds will mature in the next few years. Nomura, a top Japanese bank, wrote earlier this month that Chinese offshore corporate dollar bond (OCDB) defaults were $3.4 billion in the first 10 months of 2018. This is up from nothing compared to a year ago. Analysts are now waiting for a wave of defaults in 2019 and 2020. It might not produce a national or global financial crisis, but there might be a domino effect. A Federal Register report suggests that the Trump administration is thinking about limiting technology exports to curb intellectual property theft, maintain national security, and amplify export-control rules. But experts note that such a move would impact US manufacturers as much as Chinese purchasers. Also, in the wake of the report, the market reduced the odds of a new trade agreement between the world’s two largest economies from 50% to 40%. In other domestic news, China is importing more rice from Vietnam, accounting for about one-quarter of the nation’s total rice exports. It is estimated that China imported 1.24 million tonnes of rice in the first 10 months of the year, totaling $640 million. Meanwhile, Beijing continues to clamp down on consumer good imports by overseas personal shoppers. This practice typically avoids taxes and allows consumers to purchase goods unavailable to them. The government will soon implement a law that will require ecommerce platforms to register with the state and pay all import taxes. 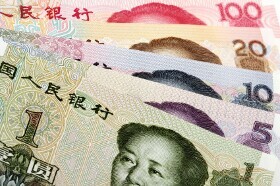 The USD/CNY currency pair rose 0.05% to 6.9458, from an opening of 6.9420, at 15:37 GMT on Tuesday. The EUR/CNY tumbled 0.49% to 7.9151, from an opening of 7.9538.